Potable water and sanitation are vital for personal hygiene and public health. They help to prevent infectious diseases such as diarrhea, dysentery, malaria and guinea worm infection. Other benefits include improved school attendance by children and reduced workloads for women, who can be freed to engage in economic activities and contribute to the community. 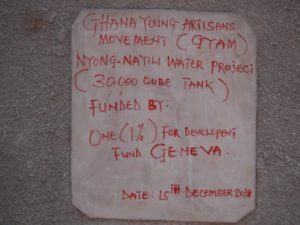 To help realize these benefits, in 2018-2019 the One Percent Fund has supported The Ghana Young Artisans Movement (GYAM) in implementing a Water and Sanitation Management Project (WASH) project in the Nyong-Nayili communities, which are located in the Karaga District. To launch the project, GYAM organized a participatory planning meeting to sensitize the communities and the local schools to the issue. The 52 participants included community leaders, school-management committees, women active in community development, the head teachers of both the primary and junior high schools, teachers and community members. The aim was to ensure that the communities felt ownership of the project and were committed to supporting its implementation. 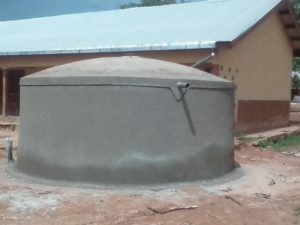 A 30 000 m3 rain water harvesting tank was constructed in the school to cater for 600 pupils and nine teachers. This has reduced the long distance and the time spent to travel to find water during school hours. In addition, the construction of a four-seater Kumasi Ventilated-Improved Pit (KVIP) toilet is almost complete. For GVAM, the enthusiasm of the women who participated in the project and took ownership of it has been a particularly critical factor for its success. Their active contribution is essential for ensuring that such social development projects will be sustainable. Such projects can help to empower them in asserting their human rights and addressing certain traditional and cultural practices that are not in their favor. Ensuring gender parity and sensitizing opinion leaders and other men in the community has had great value beyond the immediate goals of proving clean water and sanitation. Inadequate funding is always an issue for development projects. Some costs, such as those for transporting the needed equipment from other regions, ended up being higher than expected and the project team has had to adapt. 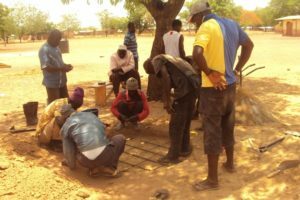 GVAM continues to fundraise for further WASH activities in the region.